At Protovision we believe in innovation. That's why we always think one step further when it's about giving you the most enjoyable playing experience on your Commodore 64. One of the most successful game concept ever probably is Bomberman, Dynablasters or how you ever would like to call the principle of bomb-hunting. 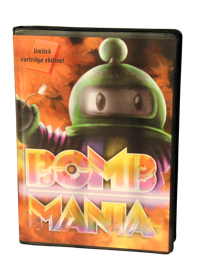 There are several versions for the C64, but Bomb Mania by Protovision sets new standards once more. Here, more than the usual two players can fight each other in the bomb labyrinth - up to four players can take part at the same time! If you now think of complicated keyboard handling, just forget it again. You and your friends can play Bomb Mania with up to four (4) joysticks simultanously! By means of a Userport interface, which you can order together with the game or, with a little knowledge, can also build yourself, two more joysticks can be connected - and the fun can begin! And this interface is not just for Bomb Mania - it is supported by a number of other games, too: Other titles by Protovision making use of the 4 Player Interface are Tanks 3000, Hockey Mania, Team Patrol and Snacks 4 Snakes. Furthermore, some already existing games were adapted to work with the 4 Player Interface (more information here). C64 or C128 in C64 mode, 1541/1571 Floppy, 2 to 4 Joysticks. The 4 Player Interface is required when playing with three or four players. 1541 Ultimate, SD2IEC, uIEC/SD, IEC-ATA, MMC Replay, MMC64, 1581, CMD FD, CMD HD, CMD RAMLink, IDE64. A demo version of Bomb Mania is available! Spread the demo as much as you can and like. Have fun with it! Mushrooms pop up everywhere that carry on the bombs' explosions and thus cause heavy chain reactions. Some nice ghosts with R-bombs in the back-pack tend to appear here. The explosions are mostly fatal - at least to some players. Here every player is able to kick the bombs with their feet (without collecting the corresponding extra). The best direction for this probably would be the position of some other players. Never sleep, never rest - Lay bombs at night! And train your memory, because you can see the bombs only when it flashes - and this does not happen that often! Here you can hide wonderfully in the pipes... or place bombs inside them. But beware, the other players might do this as well! The screen is bricked up after some time. This is going to be a narrow thing really! All players are fully equipped with lots of bombs and high explosion range. Good luck while trying to escape!